Landmannalaugar is a geothermal wonderland in the Fjallabak Nature Reserve, home to lava fields, hot pools, and steam puffs that rise from the earth. Hike among vibrantly hued mountains and explore highlands dotted with glaciers, black sand beaches, geysers, and waterfalls. Stunning and remote, this area is a perfect representation of all the Icelandic landscape has to offer. 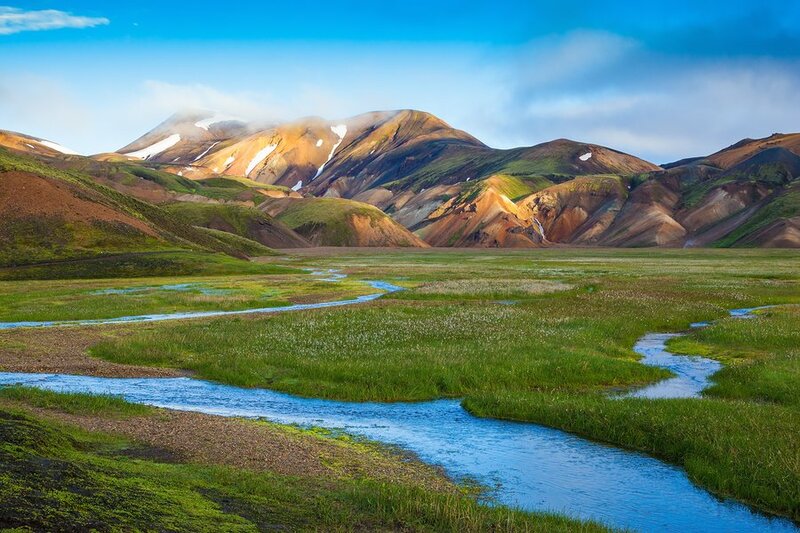 The highlands of Landmannalaugar are famous for their colorful mountains and steamy, spring-fed streams. Hikers can take the 4-5 hour road through Laugaharaun lava fields, Vondugil canyon, and the sulfur-skinned Mt. 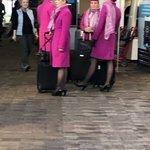 Brennisteinsalda. Continue down into Graenagil, and if time and weather are favorable, you may want to climb up Blahnukur Summit for its panoramic views. Don’t forget to bring your swimsuit for a post-hike soak in one of the area’s geothermal pools! Landmannalaugar is only accessible in summer months, and the three roads leading to the area become accessible on different dates each year depending on the weather conditions. The road from the north, F208 via The Highland Centre at Hrauneyjar, is well-paved and typically opens in mid-June. Road F225 is the western route, which is also generally open starting in June. The third option is F208 from the south - while this is the most visually rewarding route, it's also the most difficult to drive due to the rough roads. From the junction with Highway 1, expect a 2-3 hour journey to get into the park. Check with the Public Road Administration (Vegagerdin) for more information on road conditions and park access. There are a few daily scheduled buses from Reykjavik BSÍ Bus Terminal to Landmannalaugar. A few also leave from the Laugardalur campsite, the City Hall building, or Kringlan Shopping Center. Additionally, both Reykjavik Excursions and TREX offer daily buses from Reykjavik to Landmannalaugar, and the journey takes approximately three hours. It is possible to do a long day hike in Landmannalaugar and still return to your accommodation in Reykjavik on the same day - you’ll arrive at Landmannalaugar in the morning and return with the latest bus back around 8 PM. For current schedules, check out Nordic Adventure Travel. Landmannalaugar is home to plenty of trails, but only a handful are marked. From the standard day hike to a multi-day trek into the highlands, adventurers have an incredible selection of natural playgrounds to choose from. 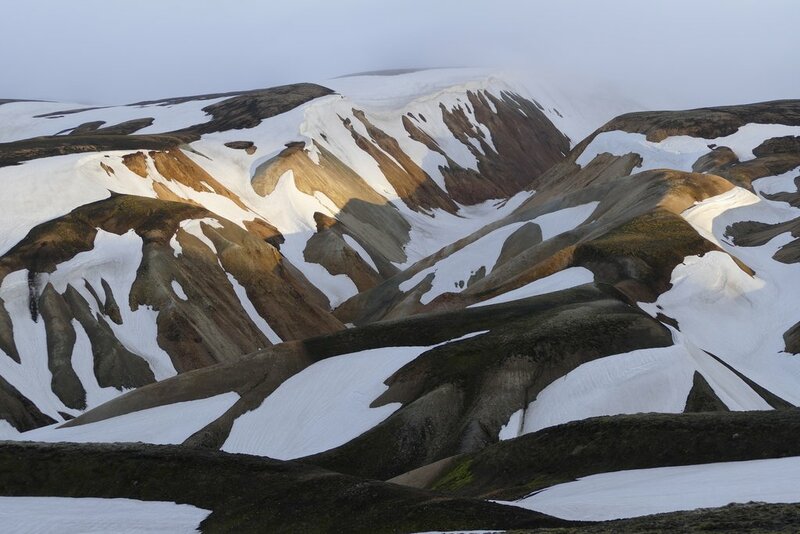 This 4-hour hiking trail starts from the main hut in Landmannalaugar and continues through Laugahraun lava field, Vondugil Canyon and up to the multicolored summit of Mt. Brennisteinsalda, with its steaming vents and sulfur deposits. Walk down Grænagil Gorge, brilliantly green with colored rhyolite. 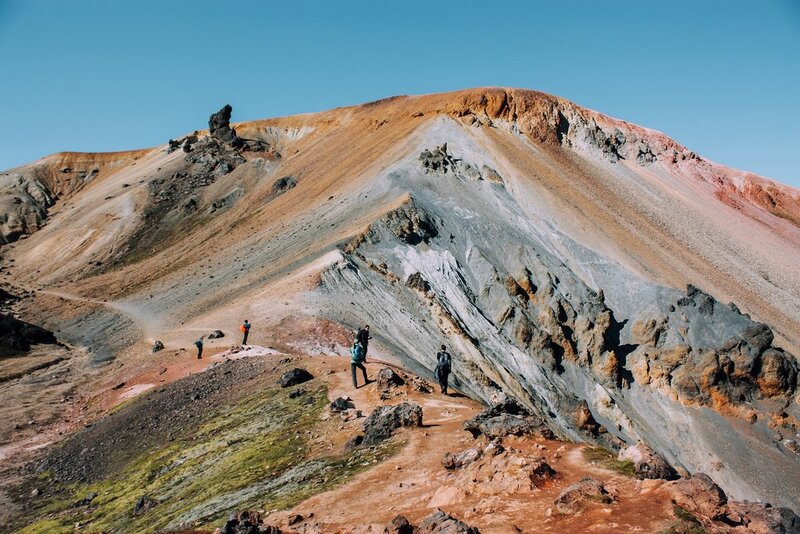 If you have time, hike up Bláhnúkur Volcano, a 60,000-year-old gray volcano offering panoramic views of the valley. It takes approximately one hour to reach the peak. From there, you can view the medieval lava field and the kaleidoscopic colors of the gray, pink and orange hills. The Laugavegur hike to Thorsmork is a demanding, multi-day hike with huts and campsites en route. 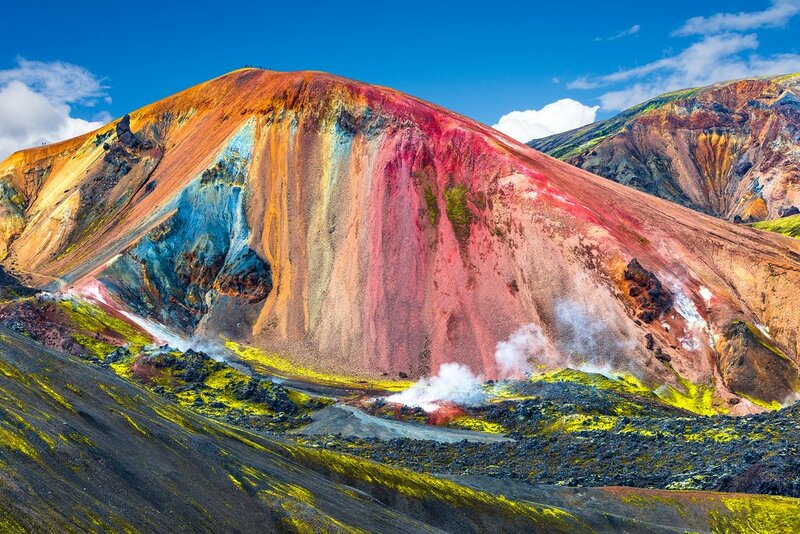 You’ll trek across volcanic plains, rainbow-colored hills, glaciers, canyons, sandy areas, snowbound plateaus and freezing rivers. In high season (late June to August) marker sticks are clearly visible every 200 meters or so, though given the trail's heavy traffic, it's unlikely that you'll lose your way. You can also extend this hike by 15.5 miles (25 km) through beautiful scenery to reach Skógar, which will add an additional day or two to your time. You can hike Laugavegur by yourself, with a guide, or a sherpa that will move your heavier packs from one campsite to the next, while you carry your own daypack. If you're interested in staying in one of the huts, it's highly recommended that you reserve in advance. They are available at the following points: Landmannalaugar, Hrafntinnusker, Álftavatn, Hvanngil, Emstrur and Þórsmörk. If you don't want to hike all the way to Thorsmork, you can hike simply to Hrafntinnusker. This massive and dramatic mountain in the highlands is just a few hours from Landmannalaugar. Hrafntinna is “obsidian” in Icelandic, and the dormant volcano is named for the black glass rocks that pepper its slope. This is a relatively large active geothermal area, so you may see plumes of smoke coming from deep under the ice. 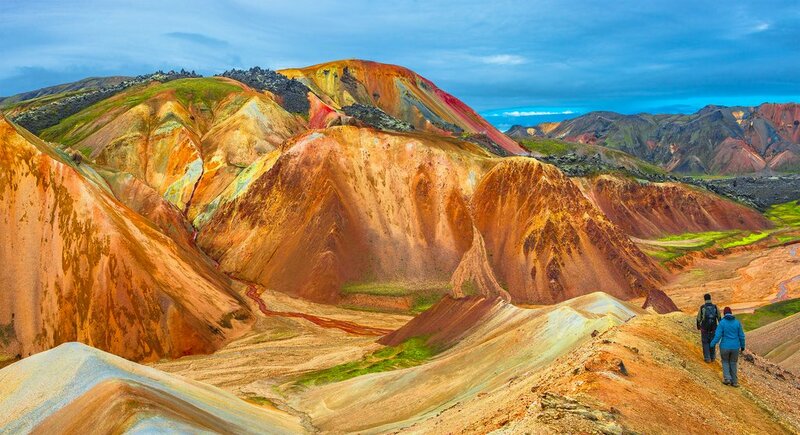 To get there, hike south from Landmannalaugar. This beautiful trail will take you across valleys, mountains, and glaciers, at a pace of about 7.5 miles (12 km) per day. Hike from Landmannalaugar through the Laugahraun lava field, onto the slopes of Brennisteinsalda and its plateau with panoramic views. After 3-4 hours, you’ll arrive at the hot spring Stórihver. After a soak, hike onto Höskuldsskáli hut, which sleeps about 36 people. There may be snow and thick fog, so proceed with caution. From the hut, you can explore the ice caves about 1 mile (1.5 km) away. On the second day, the first part of the trail will lead you through a valley with small ravines. If visibility is good, hike up Háskerðingur mountain. Soon you’ll arrive in an area with dark palagonite mountains, blue glaciers, and lush vegetation. The trail down Jökultungur is steep but is the only way to the banks of the Grashagakvísl river. From there, it’s a breezy, flat walk to the two huts beside Lake Álfavatn. 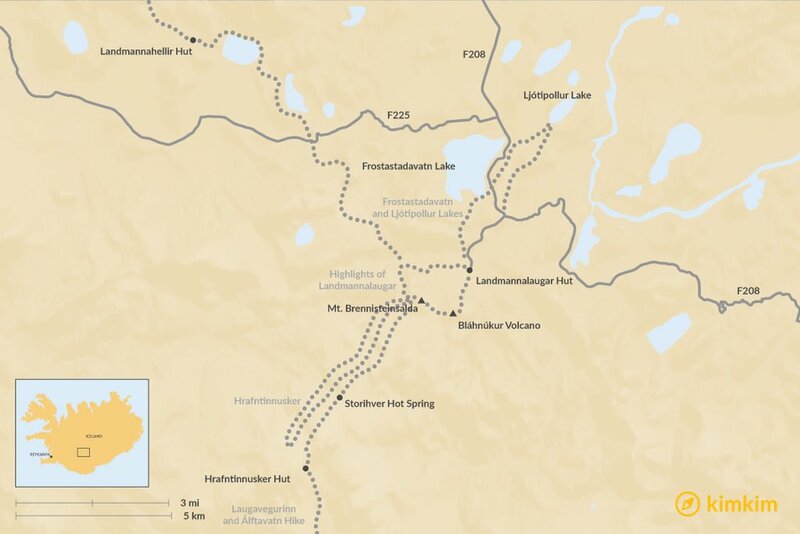 Travel along the dirt road northwest from Landmannalaugar, then turn off at the signpost for Lake Frostastadavatn. This small climb takes you to this magnificent fishing lake, with scenic views of Norðurnámur Hill. You can hike around the rim in about 3 hours, or climb up the hill for a different perspective. Descending from the ridge, hike along the flat road until you reach Ljótipollur, the “Ugly Pond.” The name doesn’t do this lake justice, however, as the terrain is quite beautiful with rocks in hues of rust and green. The water comes from silted groundwater below the surface of the crater, which accounts for the beautiful turquoise color. You can rent a horse to cross certain trails otherwise difficult on foot. Horse rental facilities are typically open starting on July 1 each year. Hop on an Icelandic horse for a ride through meadows, green highlands and pass colorful mountains. Fishing is allowed in the mountain lakes, provided you have a fishing license - just be sure to pack your own fishing rod. If you're joining a tour guide, they might take you to the crater lake Ljótipollur for a hike and fishing fun. At the trailhead of the Laugavegur route is the Countryman's Pool, natural hot springs where you can warm up or chill out after a long day's heavy hiking. Head to the edge of the Laugahraun lava field, where hot water streams mix with natural cold water, to an ideal effect of 96-104°F (36-40°C). In the Fjallabak Nature Reserve, campsites are restricted to designated locations at Landmannalaugar, Landmannahellir and Hrafntinnusker. Bring your own tent or reserve one of the Mountain Huts operated by Ferðafélag Íslands. Make sure that you book well in advance during summertime, as these tend to fill up quickly. Pack a sleeping bag no matter where you’re sleeping, as the huts don’t stock linens. On-site facilities at Landmannalaugar huts also include a shower block, and the area is sheltered from any wind and rain by a massive rhyolite cliff. Outside the reserve, the highland motel Hrauneyjar is another option. The best part of camping at Fjallabak are the natural hot springs that emerge into a meadow from underneath a 15th-century lava flow, where they then mingle with a cooler stream. Wade or swim up this stream until the water temperature increases and pick a spot to enjoy a soak. The hot springs can get busy on weekends and when the Reykjavík bus arrives between 1 and 3 pm, so be sure to time your soak carefully to avoid the crowds. In high-peak times, the “Mountain Supermarket” is open - a converted school bus that doubles as a café and food store. Occasionally they’ll offer local fresh fish such as Arctic Charr, caught in a mountain lake. Don’t count on this shop being open or offering reasonable prices, however - stock up on basic trail rations before you leave town. If driving, we strongly advise you to make sure it’s a 4-wheel-drive, as normal car rentals are not covered by local insurance policies in the highlands. Be sure to have plenty of gas, the nearest station is nearly (40 km) from Landmannalaugar! Fjallabak Natural Reserve is open only in summer. Be prepared for various weather conditions; low temperatures, high winds, heavy rain and snow can occur at any time of year. If you hike during the colder months - May and September - take note that the amount of snow cover is increased, which may make it difficult to navigate in unfamiliar territory.